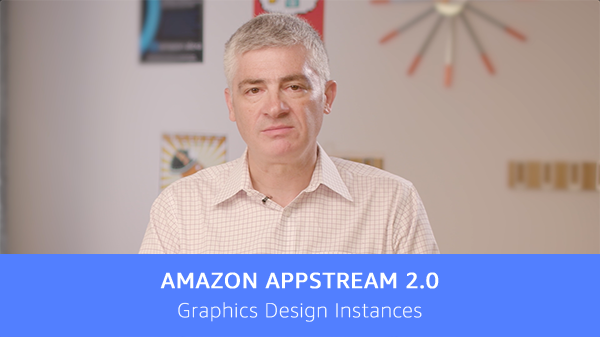 Today, Amazon AppStream 2.0 is introducing a new GPU instance type, called Graphics Design. This new Graphics Design instance type allows you to run graphics applications at a fraction of the cost of using graphics workstations, and reduces the cost of streaming graphics applications with AppStream 2.0 by up to 50%. Graphics Design instances are ideal for delivering applications that rely on hardware acceleration of DirectX, OpenGL, or OpenCL, such as Adobe Premiere Pro, Autodesk Revit, and Siemens NX. With this launch, AppStream 2.0 now offers three graphics instance types – Graphics Design, Graphics Desktop, and Graphics Pro – optimized to support a broad selection of graphics workloads. The new Graphics Design instance type is powered by AMD FirePro S7150x2 Server GPUs and equipped with AMD Multiuser GPU technology. The instance type includes four instance sizes with different GPU and compute combinations that scale to support the performance requirements of a range of graphics applications across use cases such as creative design, media and entertainment, gaming, and engineering. The smallest instance size available is large, with 2 vCPU, 7.5 GiB system memory, and 1 GiB graphics memory. The highest performing instance size available is 4xlarge with 16 vCPUs, 61 GiB system memory, and 8 GiB graphics memory. This range of instance sizes allows you to select the configuration that matches your application’s requirements and provide your users a fluid and high-performance experience. To get started, simply select an AppStream 2.0 Graphics Design instance when launching an image builder or creating a new fleet. You can launch Graphics Design instances using either the AWS management console or the AWS SDK. To learn more, please see AppStream 2.0 Instance Families. The AppStream 2.0 Graphics Design instance type is available today in all AWS Regions where AppStream 2.0 is offered. AppStream 2.0 offers pay-as-you-go pricing, please see Amazon AppStream 2.0 Pricing for more information. If you are new to AppStream 2.0, you can try already-installed applications by visiting the AppStream 2.0 website.